Growth is the driving force today in most conversations from the boardroom to the mirror. We desire better in everything from the bottom line to our personal circumstance. Why then does it seem so hard to get traction toward the objective? One key is to understand that to get from here to there one has to accurately assess where we are now. To honestly establish our current position requires more than a feeling. Strategic variables need to be inventoried and evaluated in the context of reality in the environment of the moment. Those facts are then triangulated against the clear declared intent of where we want to go and the different roads available to get there. Then, strategic plans are drawn accordingly and – only then – can we begin to execute against benchmarks and timelines. The traction problem is that too often companies and individuals jump right into the action of activity and measurement without doing the advance work of establishing current position and defining desired position. We have pressure to achieve results so we settle for one-off small victories and short-term gains. Micromanagement and self-congratulatory inflation of small wins – and slippery traction – is born. Positioning is a long strategy that ultimately yields results that can be sustained and produce bigger wins. Achieving desired position does not always follow a straight line, but rather navigates smart and contextual pathways that may contain twists and turns – but not detours from the objective. And, sometimes, these pathways may seem even counter-intuitive. Sam Houston, a Texas hero and an imperfect man, deeply understood positioning through reflection on history and personal experience. 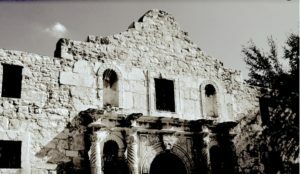 In great scenes from the 2004 remake of the classic film “The Alamo,” after the San Antonio mission has brutally fallen, Sam Houston marches east in what appears to be a retreat instead of west to meet and engage “the competition” of General Santa Anna and the victorious Mexican army. Most of Houston’s army is astounded and some near revolt as this eastward march goes on for several days with Santa Anna’s army in hot pursuit. After Santa Anna makes some tactical blunders, Houston identifies his battlefield at San Jacinto. He orders his army to turn and march to meet Santa Anna, whose army is decimated and defeated in 18 minutes. Santa Anna was captured and brought to Houston, whose still emotionally charged men wanted to hang Santa Anna on the spot to avenge the Alamo. Without emotion, Houston told his men: “You will settle for blood. I want Texas.” Santa Anna signed over Mexico’s rights to Texas in exchange for his life. Sam Houston accurately assessed his current (and weaker) position in the immediate aftermath of the Alamo. Even though emotions over the Alamo defeat were raw and demanding response, Houston declared a larger desired intent (win Texas). He honestly evaluated his current position in the context of the strategic variables of the moment and he repositioned for the larger victory, never losing sight of his ultimate goal. The strategy of positioning, which always must come before engagement, too often seems to be a lost value in today’s world of frenetic activity and small wins in the name of growth, business development or personal advancement. Too many leaders today are too willing to settle for the quick wins and the small advances of appeasement when the grand prize of Texas might be just over the horizon.